Notejoy offers a powerful integration with HubSpot CRM, one of the fastest growing CRM solutions. 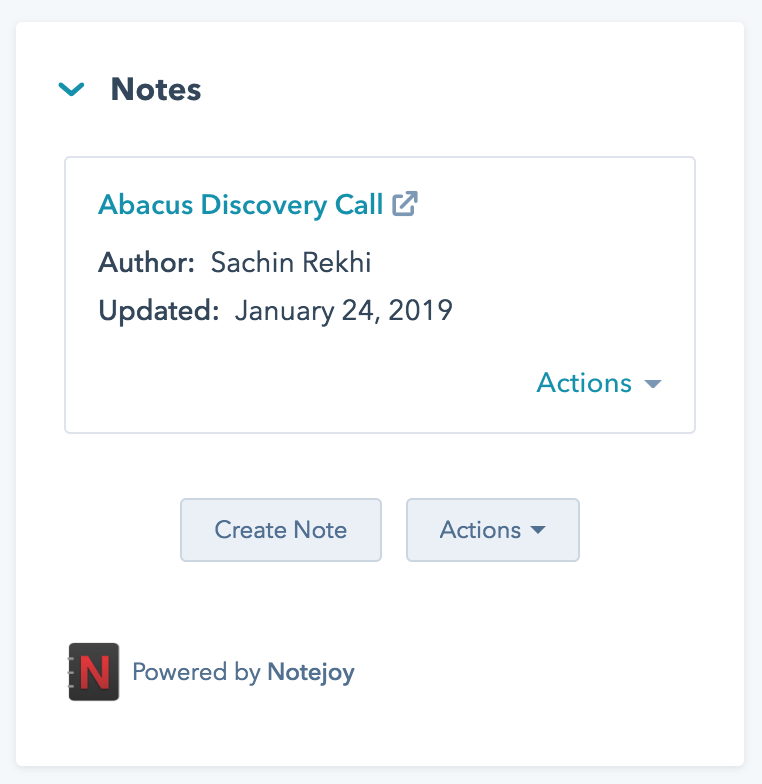 HubSpot and Notejoy work seamlessly together, enabling sales professionals to more efficiently capture, organize, and share their notes, significantly improving the daily productivity of the modern sales team. Get started by connecting HubSpot from the HubSpot Integration Page. You can now easily create and attach notes directly from HubSpot, helping you to stay productive when you are working in your CRM. After you setup the integration, a new Notes card will appear in HubSpot contacts, companies, and deals. You'll be able to create a new note from there whenever you are looking to capture meeting notes, deal details, and more. If you've already created a note, you can easily attach your existing note to the HubSpot record as well, so you can always find it whenever you come back to this record. While contact, company, and deal records may be linked, the note is only attached to the original record that you attached it to. If you'd like it to show up in the other records, you can attach the same note there as well. Anytime you come back to this record, you'll see all the notes that have been attached to it for quick reference. If need be, you can always remove notes that are no relevant from the records as well. If you have others on your team that you want to be able to see the contents of your notes, make sure you create your note in a team library that is accessible by each of your team members. You can create team libraries from the Notejoy app and invite by email address each team member you'd like to have access to the note. Once you set this up, as long as you always create new notes in the same team library, everyone will have access to the note. When you right-click a note and select View Note from the Notes card, you'll be brought to Notejoy's rich text editor right within the HubSpot experience. From there you'll be able to view the note as well as directly edit the note. You'll have access to Notejoy's full styling options. You'll also be able to embed images & documents. 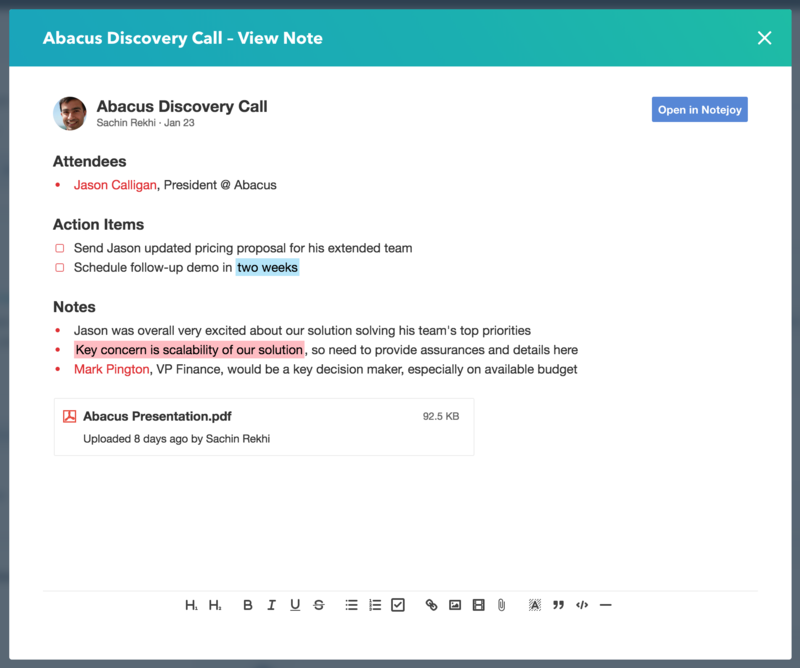 As well as collaboratively edit notes with others on your team across all of Notejoy's apps for desktop, mobile, and web. You'll also have the option to directly deep-link to the note in Notejoy if you'd prefer to take advantage of Notejoy's full web experience for crafting your note. You'll also have the option of living within the Notejoy experience but still working seamlessly with HubSpot. A new HubSpot sidebar will be available in Notejoy from the more actions menu in the top-right corner of any note. From there you'll be able to associate the current note with a HubSpot contact record. 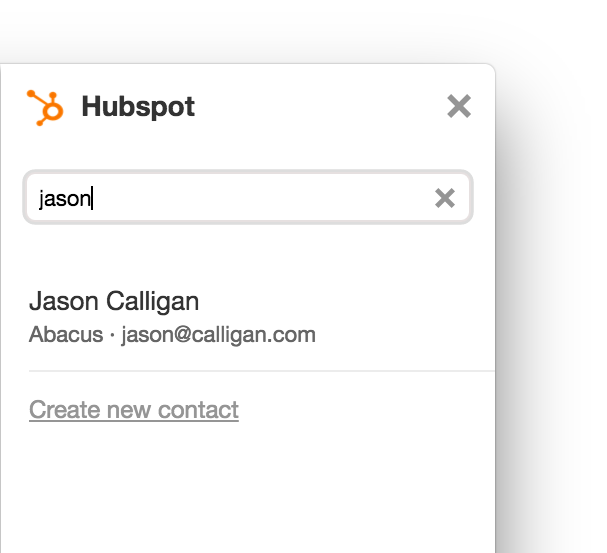 Say your taking a meeting note or a phone call note, you can quickly search for the contact in HubSpot and associate it so that you'll always be able to reference this note when you view that contact within HubSpot. 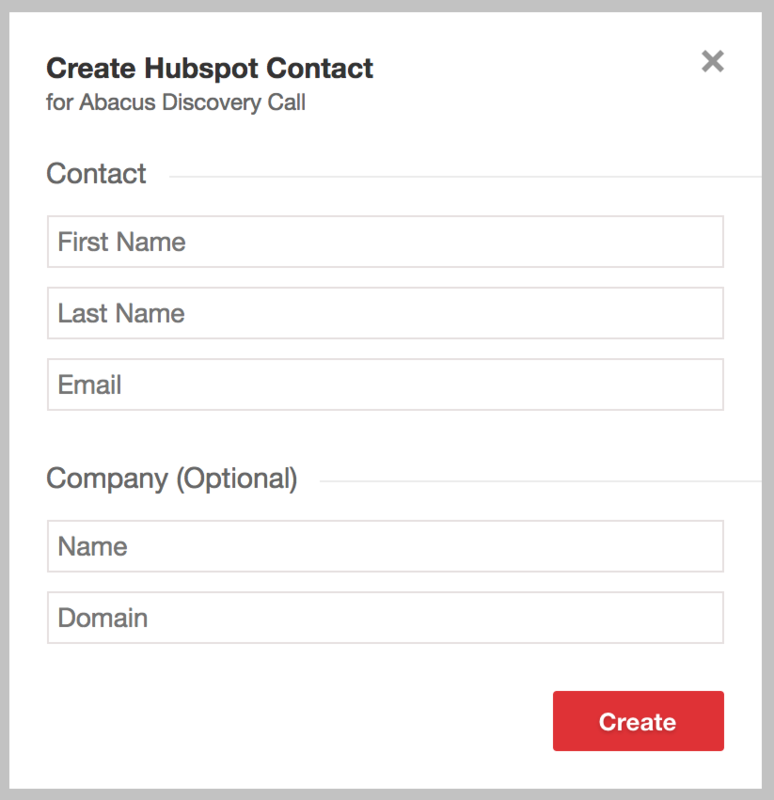 If the contact doesn't exist, you'll also have an option to create a new HubSpot contact right from Notejoy. Once you've associate the note with a contact, you'll immediately see that contact's details in the sidebar. If the contact is associated with a company or a deal, company and deal details will also automatically appear in the sidebar. Or if you've attached this note to a company or deal within HubSpot, that will also cause those record details to be displayed. You'll also be able to update any of the contact, company, or deal details you see directly from the HubSpot sidebar. This makes it super easy to keep your CRM up-to-date while working productively in Notejoy's app.